Potty Training: Are they ready? The thing with potty training is that they need to be ready. If not it will be stressful! You could also do some damage with them then not wanting to do it later on. When we first tried with Alfie it was clear he was not ready and neither was I. It was definitely right to leave it for a while. There are other signs that they are ready but those are the main ones that Alfie showed. Alfie recently saw the potty and wanted to do a wee on it. To stop an almighty meltdow, we decided to take his lead. We let him use it to see what happened. He did his first wee on the potty and we haven’t looked back. We spent that day at home with Alfie having no pants on and us encouraging him as much as possible. I’ve got to admit that I was sceptical that he was ready and he proved me wrong. He told us every time he needed a wee and he even sat on the potty a few times without being prompted. The first few days after were very hit and miss. He was great at home but when he was out, and distracted, he had accidents. As time went on that has got so much better. I’m not going to lie he does still have accidents, but he’s still young! 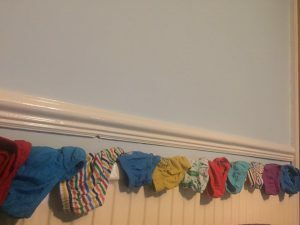 He is nowhere near ready to have no nappy at nap times or bedtimes but the nappies are normally dry or not as full as they used to be. So he must be learning to hold it even more so. All in all, he is doing amazingly and we are very proud. We even have had a 3 hour car journey with no accidents and that is definitely our biggest potty training achievement! The potty will have to be taken EVERYWHERE! We left it to James when he wanted to potty train. He was 100% sorted at home with me but then he’d have two days at nursery each week and he’d have accident after accident, so we stopped putting him in pants (even at home) until he left that nursery. When he started at a new one they were so encouraging and gentle that he started again and we took his lead. He was sorted at night and day at the same time, and didn’t have accidents at all. Much easier to follow their lead! Now we are starting to get the queues from Noah about his potty readiness, and he’ll go for a wee before his night time nappy goes on, or before his bath. So in the not too distant future I might be waving goodbye to nappies! Well done Alfie George for managing a 3 hour car journey! Fabulous! I love the photo of all the pants! !